Day 1: Kidney and Liver. 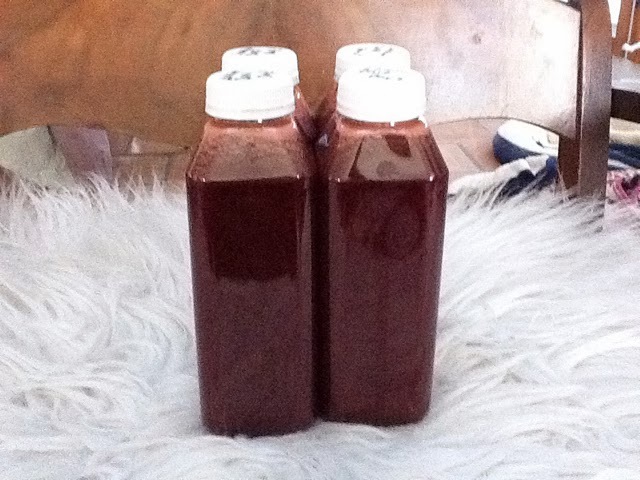 The juice is cucumber, celery, kale, broccoli, spinach, cilantro, lemon,apple,beet greens, tomato and romaine. Day 2 : The Intestines ( they call the intestines the 2nd brain……I hope not especially raising 2 boys ) cucumber, celery, kale, cilantro,broccoli stem, spinach, parsley and ginger. Day 3: Superskin and Colon Detox . Cucumber, celery, beet, carrot, parsley, cilantro, kale,spinach, lemon, ginger, garlic, cabbage, romaine and garlic. Though I did not eat anything for 3 days and was starving, ( my family was gone for the weekend, which was a great idea considering the possible grumpy side effects ) and still drank some Louis Jadot Chardonnay nightly my skin looked super dewy and my eyes were whiter. All I kept thinking about was what I was gonna eat for breakfast on the 4th day. I am convinced much of the benefits are due to the tremendous amount of water I was consuming, the cute girl told me there is like 30 celery stalks in a serving. I definitely believe for the most part we do not CONSISTENTLY drink enough water. I would do the fast again sans the Louis, but have integrated juicing into my daily routine. My favorite is the beet juice with jalapeño . I always ask for more jalapeño for my lunch juice. Aside from my new conviction regarding water consumption , I truly believe including fresh organic juices in your daily menu is tres Bueno for one’s skin.